Mark Rubinstein has been making recordings since he was a child, when he became fascinated with his father's reel-to-reel tape machine. He produced his first professional recording at 14, and has since forged a musical career juggling the dual roles of recordist and performer. His work as a recording engineer has led to Grammy nominations and platinum records for his clients, and his productions are noted for their clarity of sound and attention to detail. As a performer, his eclectic taste and ability on a wide array of instruments have combined to generate a checkered career with a number of strange twists and turns. 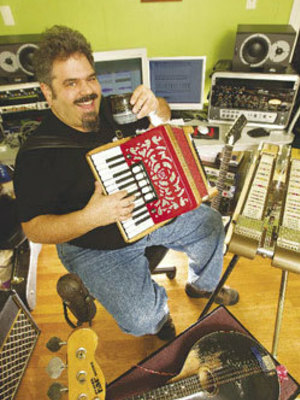 Rubinstein's main instrument is piano, but he has played drums in punk bands, electric bass in salsa groups, and accordion in settings ranging from symphony orchestras to avant-garde theatre pieces. His interest in ethnic music has led him to seek out performance opportunities in Greek, French, German, Italian, Mexican, Puerto Rican, Cuban, Brazilian and traditional Jewish music. Career highlights include music direction for the winter 2008 production of The Blue Flower by Prospect Theater Company in New York; music direction for regional tap dance festivals “Soul To Sole" in Austin, Texas and “Third Coast Tap Festival/Jazz on Tap" in San Antonio, Texas; performances (on piano) with legendary jazz flutist Herbie Mann, seminal jazz bassist Eddie Gomez, saxophonist Bunky Green, and legendary tap dancers Arthur Duncan, Dianne Walker, and Sarah Petronio; European tours with noted songwriters Dirk Hamilton and George Carver; membership in influential early Texas punk band The Rejects; and recordings (as engineer) with many noted artists including Grover Washington, Jr., Shirley Horn, Cher, Liza Minelli, Aretha Franklin, Mary J. Blige, 3LW, Judy Collins, Najee, Gerald Levert, Scarface, George Duke, Bobby Womack, Backstreet Boys and Natalie Cole. As an educator, Rubinstein has served on the teaching staffs of Texas Tech University and St. Mary's University, and was most recently a lecturer in Audio Technology at the University of Texas at San Antonio. In November 2008, Rubinstein attained Digidesign certification as a Pro Tools HD Music Expert, one of fewer than 100 in the world at present. He also holds Digidesign Pro Tools HD Operator and VENUE Operator certifications. In January 2009 he assumed the presidency of the Musician's Society of San Antonio, Local 23, American Federation of Musicians. Rubinstein continues to be an active freelance musician and recording engineer/producer; he joined the staff of the School of Music at The Ohio State University as the audio engineer in September 2009.